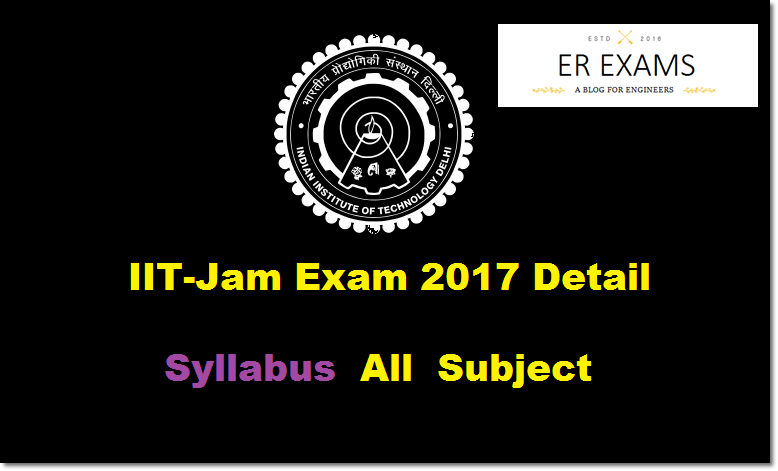 Complete detail syllabus of IIT-JAM exam 2017 in this post my previous post IIT JAM 2017 Exam Eligibility Syllabus, Eligibility, Paper pattern give all information related to this exam. In this post I provide all IIT-JAM exam 2017 Physics, Chemistry, Mathematics, Mathematical Statistics, Biotechnology, Biological Sciences, Geology all branch syllabus . Kinetic theory, Thermodynamics: Elements of Kinetic theory of gasses. Velocity distribution and Equipartition of energy. Specific heat of Mono-, di- and tri-atomic gasses. Ideal gas, van-der-Waals gas and equation of state. Mean free path. Laws of thermodynamics. Zeroth law and concept of thermal equilibrium. First law and its consequences. Isothermal and adiabatic processes. Reversible, irreversible and quasi-static processes. Second law and entropy. Carnot cycle. Maxwell’s thermodynamic relations and simple applications. Thermodynamic potentials and their applications. Phase transitions and Clausius-Clapeyron equation. Ideas of ensembles, Maxwell-Boltzmann, Fermi-Dirac and Bose-Einstein distributions. Modern Physics: Inertial frames and Galilean invariance. Postulates of special relativity. Lorentz transformations. Length contraction, time dilation. Relativistic velocity addition theorem, mass energy equivalence. Blackbody radiation, photoelectric effect, Compton effect, Bohr’s atomic model, X-rays. Wave-particle duality, Uncertainty principle, the superposition principle, calculation of expectation values, Schrödinger equation and its solution for one, two and Wave-particle duality, Uncertainty principle, the superposition principle, calculation of expectation values, Schrödinger equation and its solution for one, two and three-dimensional boxes. Solution of Schrödinger equation for the one-dimensional harmonic oscillator. Reflection and transmission at a step potential, Pauli exclusion principle. Structure of atomic nucleus, mass and binding energy. Ra-dioactivity and its applications. Laws of radioactive decay. Solid State Physics, Devices and Electronics: Crystal structure, Bravais lattices and basis. Miller indices. X-ray diffraction and Bragg’s law; Intrinsic and extrinsic semiconductors, variation of resistivity with temperature. Fermi level. p-n junction diode, I-V characteristics, Zener diode and its applications. Boolean algebra: Binary number systems; conversion from one system to another system; binary addition and subtraction. Logic Gates AND, OR, NOT, NAND, NOR exclusive OR; Truth tables; combination of gates; de Morgan’s theorem. Atomic and Molecular Structure: Fundamental particles; Bohr’s theory of hydrogen-like atom; wave particle duality; uncertainty principle; Schrödinger’s wave equation; quantum numbers; shapes of orbitals; Hund’s rule and Pauli’s exclusion principle; electronic configuration of simple homonuclear diatomic molecules. Theory of Gasses: Equation of state for ideal and non-ideal (van der Waals) gasses; Kinetic theory of gasses; Maxwell-Boltzmann distribution law; equipartition of energy. Chemical Thermodynamics: Reversible and irreversible processes; first law and its application to ideal and non-ideal gasses; thermochemistry; second law; entropy and free energy; criteria for spontaneity. Chemical and Phase Equilibria: Law of mass action; Kp, Kc, Kx and Kn; effect of temperature on K; ionic equilibria in solutions; pH and buffer solutions; hydrolysis; solubility product; phase equilibria phase rule and its application to one-component and two-component systems; colligative properties. Basic Concepts in Organic Chemistry and Stereochemistry: Electronic effects (resonance, inductive, hyper conjugation) and steric effects and its applications (acid/base property); optical isomerism in compounds with and without any stereocenters (allenes, biphenyls); conformation of acyclic systems (substituted ethane/n-propane/n-butane) and cyclic systems (mono- and di-substituted cyclohexanes). Organic Reaction Mechanism and Synthetic Applications: Chemistry of reactive intermediates (carbocations, carbanions, free radicals, carbenes, nitrenes, benzynes etc. ); Hofmann-Curtius-Lossen rearrangement, Wolff rearrangement, Simmons-Smith reaction, Reimer-Tiemann reaction, Michael reaction, Darzens reaction, Wittig reaction and McMurry reaction; Pinacol-pinacolone, Favorskii, benzylic acid rearrangement, dienone-phenol rearrangement, Baeyer-Villeger reaction; oxidation and reduction reactions in organic chemistry; organometallic reagents in organic synthesis (Grignard and organocopper); Diels-Alder, electro cyclic and sigma tropic reactions; functional group inter-conversions and structural problems using chemical reactions. Modern Physics: Inertial frames and Galilean invariance. Postulates of special relativity. Lorentz transformations. Length contraction, time dilation. Relativistic velocity addition theorem, mass energy equivalence. Blackbody radiation, photoelectric effect, Compton effect, Bohr’s atomic model, X-rays. Wave-particle duality, Uncertainty principle, the superposition principle, calculation of expectation values, Schrödinger equation and its solution for one, two and three dimensional boxes. Solution of Schrödinger equation for the one-dimensional harmonic oscillator. Reflection and transmission at a step potential, Pauli exclusion principle. Structure of atomic nucleus, mass and binding energy. Ra-dioactivity and its applications. Laws of radioactive decay. Simple Oscillators: Barkhausen condition, sinusoidal oscillators. OPAMP and applications: Inverting and non-inverting amplifier. Boolean algebra: Binary number systems; conversion from one system to another system; binary addition and subtraction. Logic Gates AND, OR, NOT, NAND, NOR exclusive OR; Truth tables; combination of gates; De Morgan’s theorem. Differential Calculus: Limits, continuity and differentiability of functions of one and two variables. Rolle’s theorem, mean value theorems, Taylor’s theorem, indeterminate forms, maxima and minima of functions of one and two variables. Probability: Axiomatic definition of probability and properties, conditional probability, multiplication rule. Theorem of total probability. Bayes’ theorem and independence of events. Estimation: Unbiasedness, consistency and efficiency of estimators, method of moments and method of maximum likelihood. Sufficiency, factorization theorem. Completeness, Rao-Blackwell and Lehmann- Scheffe theorems, uniformly minimum variance unbiased estimators. Rao-Cramer inequality. Confidence intervals for the parameters of univariate normal, two independent normal, and one parameter exponential distributions. Mathematics (18% weightage) and Physics (18% weightage). Structure of biomolecules; intra and intermolecular forces; thermodynamics and kinetics of biological systems; enzyme mechanisms and kinetics; principles of X-ray diffraction; IR- and UV- spectroscopy; analytical and biochemical techniques Microbiology, Cell Biology and Immunology: Classification of microorganisms and their characterization; nutrient requirement for growth; laboratory techniques in microbiology; pathogenic microorganisms and disease; applied microbiology; viruses and fungi; microbial genetics; cell theory; cell architecture; cell division; types of chromosome structure; biochemical genetics- inborn errors of metabolisms; innate and adaptive immunity, antigen antibodies; principles of processes of development. I hope this syllabus help you prepare your IIT-JAM exam 2017. If you like this post share with your friends.